Profoundly touched by the death of Carlo Maria Martini, now ardent intercessor by God, the prior and the community are united with the prayers and sentiments of all who love him. We recall his last visit to Bose. “By now I see before me eternal life”, he said with great simplicity and force. “I have come to give you my last greeting, my thanks to the Lord for this long friendship in his name; I count on your prayer and your affection.” And so, like a father full of solicitude, he spoke to us of death and of dying, of resurrection and of life. “One dies alone. Nevertheless, like Jesus, whoever dies in God knows that he is received into the arms of the Father, who in the Spirit fills the abyss of distance and makes the eternal communion of life to be born. In the light of Jesus’ resurrection, we can have an inkling of what will be the resurrection of the flesh. The vigilant anticipation of the final resurrection is in every beauty, in every happiness, in every depth of joy, which reaches also the body and other things". 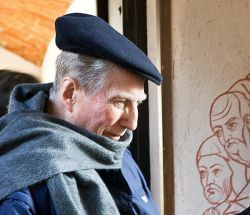 Going through at this time our correspondence of the last few years with cardinal Martini, we are struck by the regular repetition especially of two words: thanks and communion. These are words that more than ever all of us feel at this moment. Intensely revealing of his spirit as man and as believer is this note of 15 October 2011: Dear Enzo, I have read what you have wanted kindly to write about me. I would not want some mythical tendency to go around. I feel strongly what I have failed to do and for this I thank you for your prayers. Yours CMM.